On the first weekend of April, I had a Ladder event in Datchet where there wasn’t much wind and in the first day races I didn’t do amazingly but in the 2nd day I had a good first race and a very good 2nd race where I came 19th. The next weekend I was getting ready for the European Championships, there was a lot to check. The boat was also Rockfish branded, it looks amazing. On the Monday, we left for Plymouth to get the ferry towing the boat. After the overnight ferry we had 1100 miles to do, we drove for about 14 hours on the Tuesday and ended up in North Spain. The next day we got up early for the rest of the drive, at about 4pm we arrived in Murcia where I would be competing. The next day (Thursday) I got up fairly early to head down for training, there wasn’t much wind so I was practicing rolling tacks, this was good for the first few days of racing. The second day of training (Friday) I had a company called dinghy coach training me, there was a little more wind but still enough to practice rolling tacks and race starts/ techniques. The next 2 days were with dinghy coach, the wind progressively picked up slowly, the Saturday was the same as the Friday but more focused on racing and boat speed. On the Sunday (day before racing) I was hiking out fully but the sail was fully powered up. Later that day we had a practice race which was just to get a feel for the marks and line style. At the end of the Sunday just before the races there was an opening ceremony with all the different countries together all having a good time. There was a parade around the town and along the beach. I felt proud to represent Great Britain and Rockfish. The next day was race day, 1st race was at 1pm followed by another race. 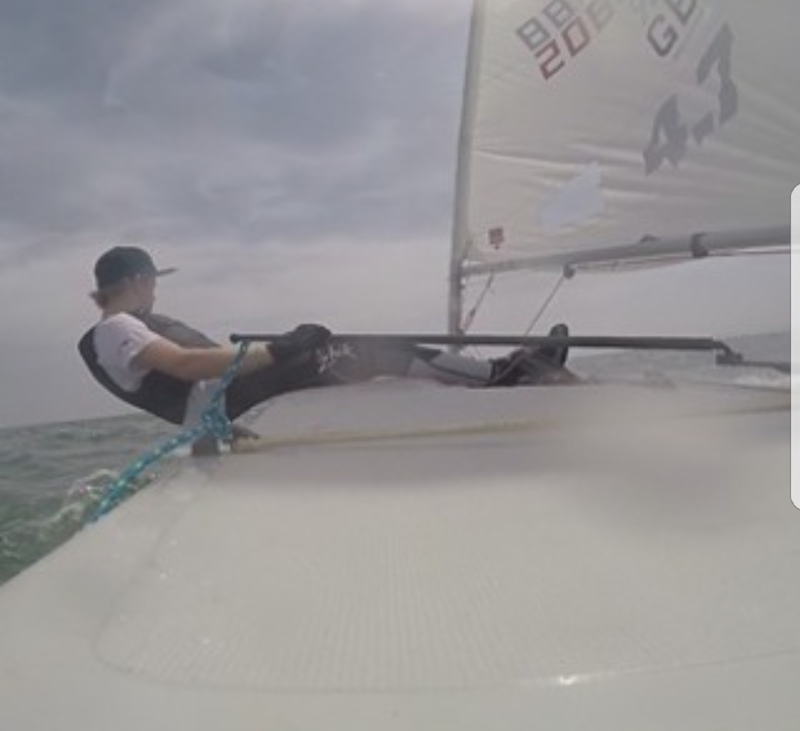 I didn’t do amazingly but not terribly either, same with the second race, I had an incident where a Portuguese boat cut me up at a mark but I was unable to get his sail or race number to protest. The next day was race day 2, two more races with not amazing results but not terrible either. I would have liked to come better in all the races but my starts weren’t very good so I need to practice them which is okay. Day 3, 20 to 30 knot winds in the morning were picking up towards the afternoon, there was a 2 hour postponement before the race committee decided to send us out racing, during the first race it was 30+ knots of wind, during the first upwind leg I capsized and got flung onto my sail, in doing this my back bent back and pulled a muscle, I was forced to carry on sailing up to the windward mark to tell them I was retiring as there was no safety cover whatsoever. I was lucky enough to have some parents help me with my boat once I got back to shore. The next day I had heat patches on my back due to the pain but the winds were even stronger than the previous day. After a day of waiting around they said there would be no racing. The day after (Friday) we went down with another heat patch on but my back was starting to feel better, the wind was as strong as the Wednesday but we had been put into our fleets now, I was in Emerald fleet. During the race postponements, we were playing handball and basketball with many different nationalities including Portuguese, French, Spanish and many more, this meant a lot to me as it showed how it doesn’t matter what race, nationality or religion you are you can all still have lots of fun and get along. After a few hours of waiting and playing handball and basketball the race committee decided they would only send the Gold fleet out to race. The next day the wind had died down a lot so we could only just hike with the sail powered up, I didn’t do very well in the first race as my confidence had been knocked from the Wednesday but the 2nd race I started to do better and the 3rd race I was doing extremely well until I got hit by my boom in an unexpected gybe and got knocked out the boat and lost a lot of places. Overall this event was an amazing experience with lots of ups and downs and I am thankful to everyone who made it possible, especially Rockfish. 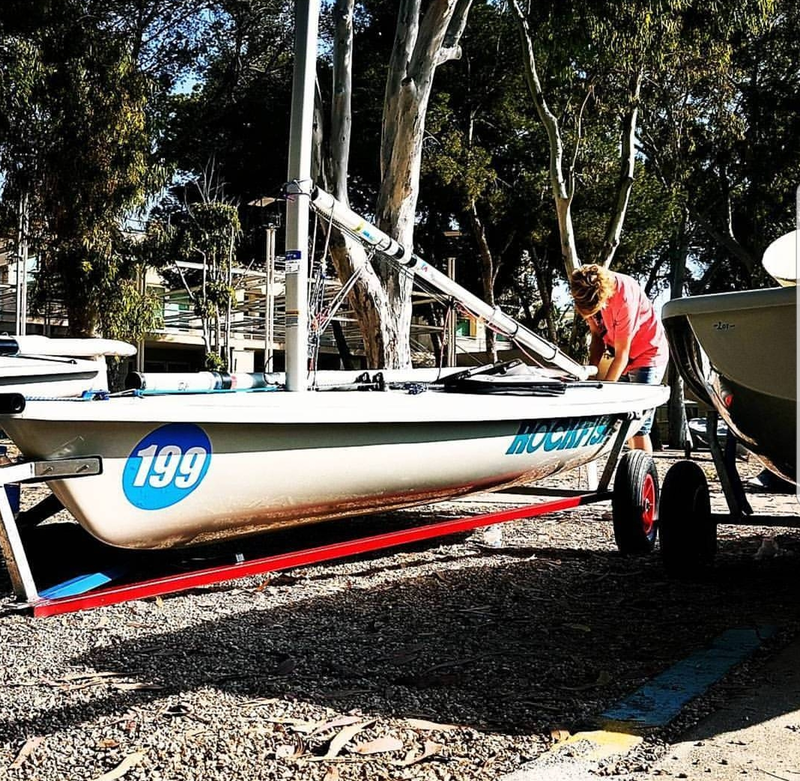 The day after we got back after school I went straight down to clean the boat and spars ready for sailing he next week. Throughout the week I cleaned the sails and foils. The boat is now all ready for racing this weekend, and I am looking forward to the rest of the year.